A few weeks ago, I was asked by Egg Farmers of Ontario if I wanted to participate in a ‘French Toast Challenge’ in celebration of October’s ‘World Egg Month’. Of course, I accepted (hello, French toast!) and I received a BEAUTIFUL basket filled with all of the ingredients needed to create a few variations on the classic French toast recipe. 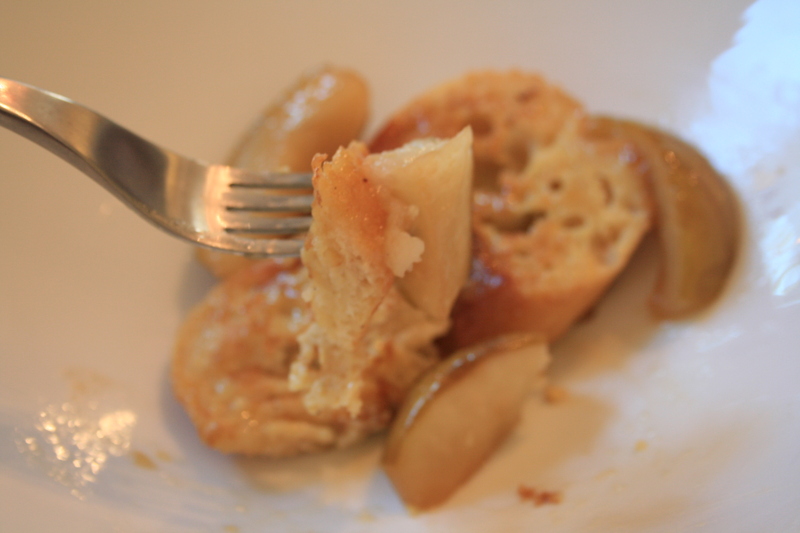 I received eggs, milk, sugar, spices, maple syrup, whipping cream, apples, pears and a gorgeous baguette! After playing with a few variations, I settled on the recipe posted below. It’s a spin on the original French toast recipe that was in the Egg Farmers of Ontario basket, served with vanilla toffee pears! 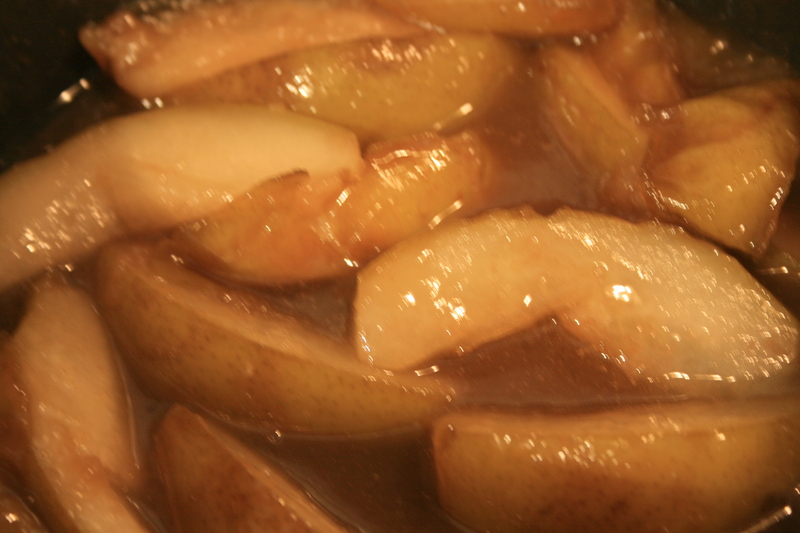 I love pears and I love toffee, so I combined the best of both worlds into one topping recipe. I don’t know about you but just reading the words “vanilla toffee pears” has my mouth watering…. You can enjoy this French toast recipe any day of the week but my favourite time to make it is on a lazy Sunday morning, when you can sit down and enjoy it at your own leisure, with a great cup of coffee. Yum! ( Inspired by Dianne’s Spiced French Toast recipe at http://bit.ly/tWmMQZ ). In a medium-sized bowl, beat together eggs, milk, sugar, vanilla and all of the spices. Heat 1 tbsp (15 mL) of the oil in a large non-stick skillet over medium heat; brush to spread evenly. Dip bread, 2 slices at a time in the egg mixture. Note: Allow the egg mixture to soak into the bread for a few seconds. Then, place soaked bread slices in hot skillet. Cook about 2 minutes then flip and cook until golden brown, about 1 minute. Remove French toast from skillet to a large plate; cover with foil to keep warm. Repeat cooking process until all egg mixture has been used. To serve, place a few slices of French toast on a plate and spoon a few vanilla toffee pears (recipe follows) and toffee sauce over the French toast. Dust with icing sugar (if desired). Heat a small frying pan over medium heat, and add the butter. After the butter has melted and foamed, put in the brown sugar and water. Stir together until the sugar has dissolved and turned a medium caramel colour. Put in the pear wedges, and cook over a medium high heat, stirring periodically, until the pears are a rich golden colour and can be pierced easily with a fork. Add the vanilla and cook for a further 2-3 minutes. Remove pan from heat. CONTEST!! Win a $50 Chez Cora Gift Certificate!! In celebration of the glory of French toast and ‘World Egg Month’, I`m egg-cited to give away a $50 gift certificate to one of my favourite breakfast and lunch restaurants, Chez Cora! -My 3 favourite egg poems will be entered into a random draw to win the $50 Chez Cora gift certificate! -You MUST be a resident of Ontario, Canada to win. -You may enter as many times as you wish! -Contest closes on Friday November 4, 2011 at 5 pm EST. -Winner will be announced on my blog on Saturday November 5. You’re delicious, nutritious, and so much more! I’m always eggscited to devour you! Congrats to Jacintha Daniel for her winning entry! Jacintha will receive her $50 Cora’s gift card in the mail next week. Thanks everyone for entering, I LOVED the poems and I know the great people at Egg Farmers of Ontario enjoyed them as well! Stay tuned for another great contest next week! A few days ago I received an email asking if I wanted to be a part of a recipe challenge and try a few of Jacques Pepin’s recipes from his latest cookbook, Essential Pepin: More Than 700 All-Time Favorites from My Life in Food. I was provided with recipes for an appetizer, main dish and a dessert and guess where my eyes went first….to the dessert recipe! As soon as I saw that it was for a chocolate mousse, I knew I had to make it. It didn’t hurt that I already had all of the ingredients at home (any excuse to have chocolate!). 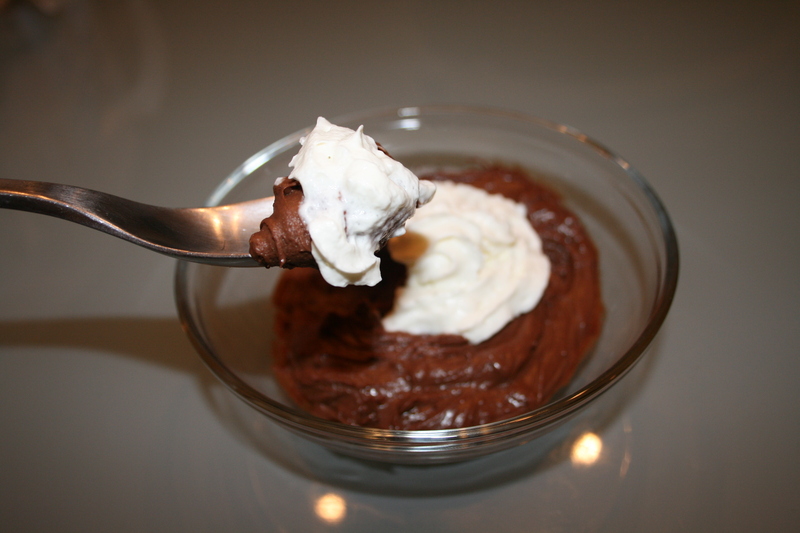 I was pretty pleased with this recipe and I enjoyed the rich taste and texture of the mousse. This is a heavy mousse, so a small serving is definitely enough (not that you can’t go back for seconds!). Made with a warm emulsion of egg yolks and sugar, and finished with cream, this is the most classic of chocolate mousses. Cognac works well with chocolate, but it can be replaced by dark rum or Grand Marnier for a different flavour. Reserve 2 tablespoons of the sugar, and combine the rest of the sugar with the egg yolks in a stainless steel bowl. Place the bowl in a skillet of hot tap water (or use a double boiler), and whisk the mixture for 3 minutes, or until it is fluffy, smooth, and at least doubled in volume. Beat the reserved sugar with the cream in a large chilled bowl for a few minutes, or until soft peaks form; do not overwhip. Transfer about 3/4 cup of the whipped cream to another bowl to use as a decoration, and refrigerate. Using a rubber spatula, combine the melted chocolate with the yolk mixture and the cognac. If the mixture starts to seize or break down, immediately stir in 1 to 2 tablespoons of the whipped cream to smooth out the mixture. Gently fold in the remaining whipped cream until incorporated. Transfer the mousse to a decorative bowl, cover, and refrigerate until set, at least 2 hours. At serving time, whip the reserved 3/4 cup whipped cream until stiff peaks form. Spoon the cream into a pastry bag fitted with a star tip and decorate the top of the mousse with the cream, or spoon dollops of the cream onto the top of the mousse. Serve. -Be careful when you’re adding the alcohol to the yolk and melted chocolate mixture, as it may start to seize or breakdown, as mine did! Thankfully, I followed the direction to immediately stir some of the whipped cream into the mixture and it smoothed it out like a charm! Chocolate should be cut into small pieces of about equal size; the smaller the pieces, the faster they will melt. To melt chocolate in a microwave oven, cover it and microwave it for 1-minute segments, leaving 3- to 4-minute intervals between the microwaving segments, so it does not scorch. To melt chocolate conventionally, put the chocolate pieces in a stainless steel bowl set over a saucepan of hot water and stir occasionally until the chocolate melts. Spinach and rapini have always been my friends, especially in the past few years when my palate grew to appreciate the different ways I could use these two leafy vegetables. I was starting to get a little bored of them both, so I decided to dive deeper into the world of leafy greens and try to use kale in a dish. So, you’re probably wondering how I call myself a vegetarian if I’ve never bought kale before! Well, I am so glad I finally did because I think I found my new favourite leafy green! My apologies to my friend Mr.Rapini but I think I’m going to be seeing a lot more of Mr.Kale from now on….mmmm. As an online recipe hunter, I found out that there are quite a few ways to make kale but I was craving a dish similar to one of my Italian favourites, pasta with rapini. I combined concepts from a few recipes and came up with the recipe below. I REALLY enjoyed it and I had it for dinner and also for my lunch the next day! I hope you will like it too! Please comment on my post and let me know how it turns out for you. Bring a large pot of fresh water to a boil. Add 3 teaspoons of salt and add the spaghetti. Cook, stirring occasionally, until spaghetti is al dente, approx. 8 to 10 minutes (or cook to your preference). Reserve 1 cup of the pasta water, then drain the pasta. Heat olive oil in a large saucepan over medium-high heat. Add the garlic, onion, chilli flakes and sautee for a few minutes until the onions are soft, stirring often. Take care not to burn the onions! Raise heat to high, add the vegetable stock and kale and toss to combine. Cover and cook for 5 minutes. Remove cover and continue to cook, stirring until all the liquid has evaporated. Check the texture of the kale at this point. If you want it to be softer in texture, you may want to add a 1/4 cup of water to the pan, put the lid back on and cook it for a few more minutes. When it reaches the desired texture, season with salt and pepper to taste and add the balsamic vinegar. Mix well and reduce heat to low. 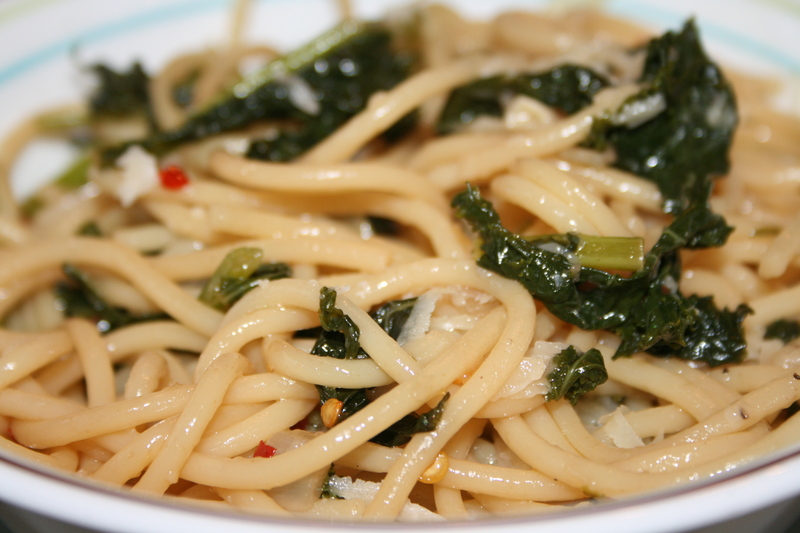 Add spaghetti to the saucepan with the kale in it, add a 1/4 cup of the pasta water and toss to combine. Check and adjust salt and pepper if needed. If the pasta mixture seems a bit dry, feel free to add a little more pasta water. Plate and serve with freshly grated Parmesan cheese on top (again, the fresh kind, not the pre-grated powdery stuff!). One of my favourite ways to have cauliflower is to make it Indian style, where it gets to hang out with some other great ingredients like garlic, onion, tomato, cumin…yum….just thinking about makes my mouth water! This recipe sounds complicated but it’s actually pretty easy. You just need a little bit of patience while it cooks! Using a mini food processor, make the spice paste by grinding the onion, coconut, garlic, coriander seeds, cumin seeds, ginger, turmeric and dried red chillies together until they form a rough paste. Note: You may need to add a few tablespoons of water to get things moving. Heat the ghee or oil on medium heat in a non-stick saucepan, add the cauliflower florets and gently fry for 5 to 8 min. Remove the cauliflower and keep aside in a bowl. Heat the oil on medium-high heat in the same pan, add bay leaves and the spice paste and fry for 3-4 minutes. Puree the tomatoes (you can use the mini food processor for this too!). Add the tomato puree to the pan and fry for 2 to 3 minutes more. Add the cauliflower, green peas, cashew nuts, sugar, turmeric, 1/2 cup of water and salt to the pan. 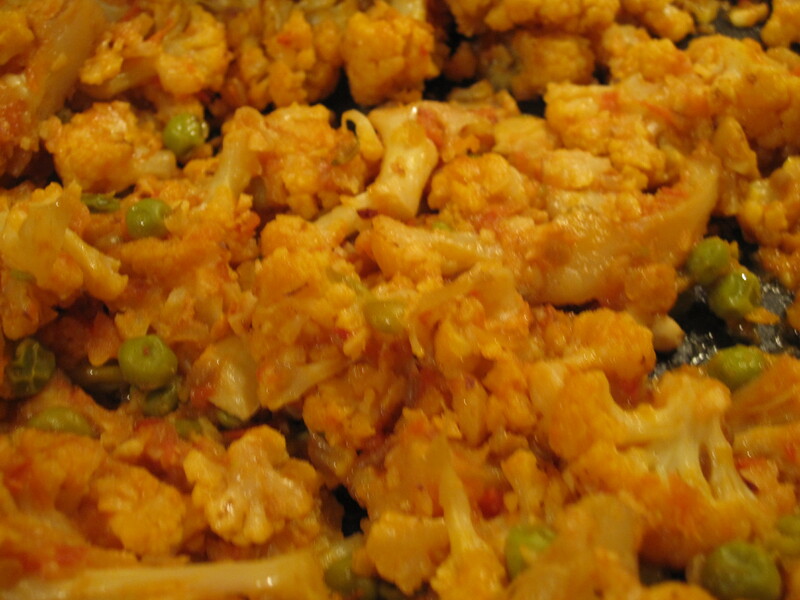 Cook covered for 10-15 minutes or until cauliflower is soft – stir occasionally to allow the vegetables to cook evenly. Note: You may want to cook it covered on medium heat for the 10-15 minutes and then lower the heat to medium low and let it simmer for another 10 minutes. Remove from heat and stir in the yogurt or sour cream until well mixed. This gives the curry a rich, creamy flavour and appearance. I enjoy this curry with rotis or naan. It would also taste great with basmati rice. Like many Indian curries, this tastes even better reheated the next day, after the amazing spices, tomatoes and garlic have had a chance to soak into the cauliflower. Yum!